Floyd Coffield underwent his baptism of fire on a bombing raid over Ploesti, Romania, flying a B-24 “Liberator” four-engine bomber on May 18, 1944. Some 600 B-24s and B-17 “Flying Fortresses” bombed Ploesti in an attempt to knock out the refineries. The German war machine derived one-third of its oil supply from Ploesti. The 89-year-old resident of Peace River subdivision, east of Punta Gorda, was a member of the 783rd Bomb Squadron, 465th Bombardment Group (H), 15th Air Force flying out of Pantinalla, Italy, during all of his 51 combat missions. It was an eight-hour round-trip from their base to the Ploesti oil fields and home again. “We were flying at 25,000 feet. We had a particular target, but the whole area was covered with smoke from the bombing. So all we could do is guess where the target was,” he said. “We started picking up flak about 30 miles out on our approach. We were about 10 minutes from dropping our bombs and I can tell you it was a long 10 minutes,” Coffield said. “We had to maintain our speed and altitude because we were flying in formation with hundreds of other bombers. “Just prior to dropping our bombs, one of our engines was knocked out by flak. I feathered the prop on the damaged engine and increased the speed on the three remaining engines to make up for the one that was out,” he said. “We dropped our bombs on the target and headed for home together with the rest of the formation. For the next four hours I flew on three engines and nursed the damaged B-24 back to base,” Coffield recalled. 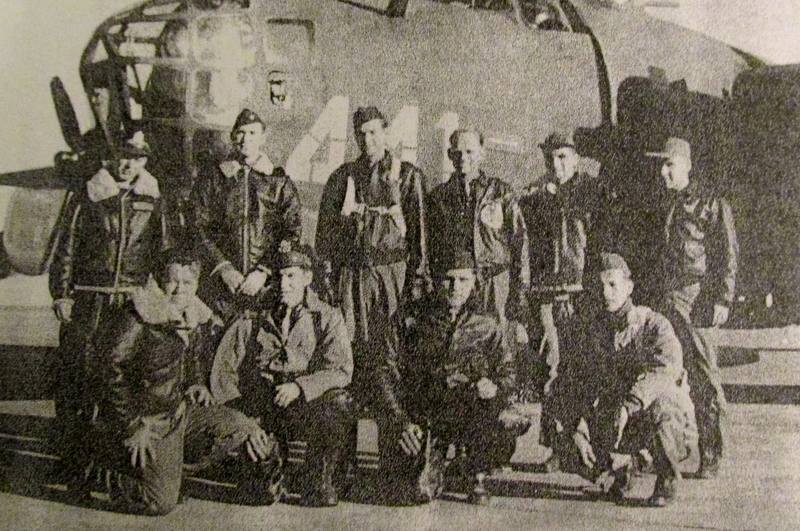 Coffield was on the 465th Bomb Group’s first mission to bomb Polesti, Romania. He completed the mission in spite of a fire in the number 3 engine, earning him the Distinguished Flying Cross, the first for his squadron. He enlisted in the Air Force on Feb. 3, 1941 and completed his 51st combat mission on Aug. 28, 1944. Photo provided. 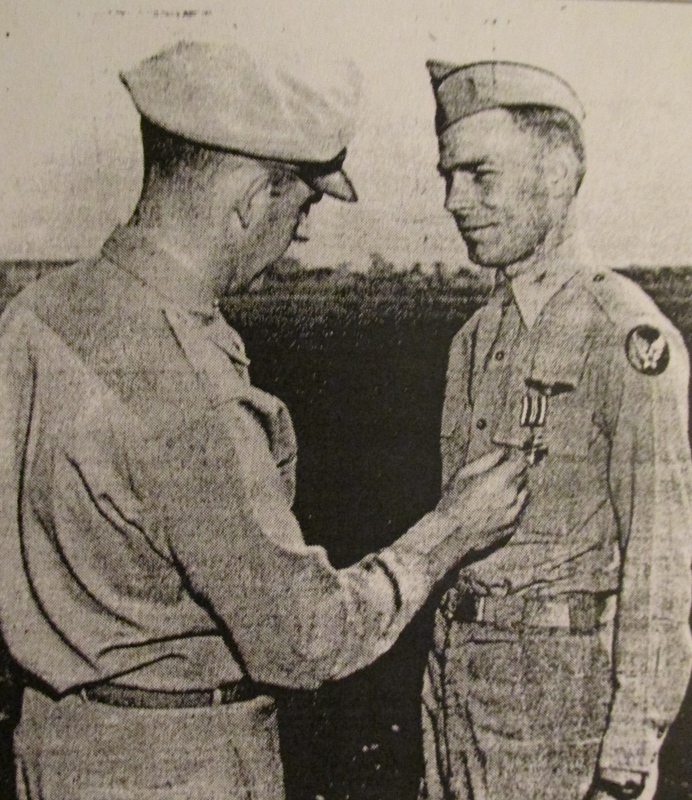 For his successful effort to bring the bomber back, he received the Distinguished Flying Cross. Two of his nine crewmen were injured by flak during the bombing run over Ploesti. One crewman lost a leg when the main artery was severed. His leg froze before they could reach base and medical attention and that may have saved his life because it stopped the blood flow. On the Ploesti raid the weather was good, Coffield said, and they weren’t bothered by enemy fighter planes attacking the huge American formation. They could see the German fighters off in the distance but they didn’t approach. Because Coffield was able to keep his bomber flying with the formation, despite its engine trouble, his crew was saved from almost certainly being shot down by German fighter planes that preyed on stragglers. 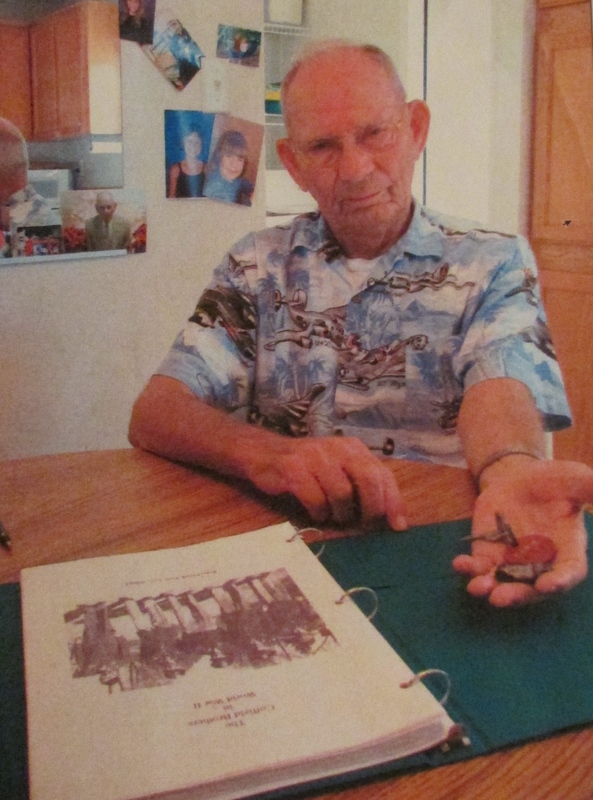 The former first lieutenant recalled two other bombing missions his crew flew that they were thankful to survive because of the intensity of the German 88-antiaircraft ground fire. They flew that mission on July 16, 1944. “The third flight that was really tough was Blechhammer, Germany. It was a center for synthetic oil refining. The Germans were waiting for us with their 88s,” he said. His mission log notes it was flown on June 30, 1944. The most important mission for Coffield and his crew was their 51st and last — flown to Szony, Hungary, on Aug. 28, 1944, eight months before Hitler and the Third Reich threw in the towel. After completing 51 combat missions, Coffield got a 30-day leave. He spent the time relaxing on the Isle of Capri in Italy. Then he shipped out for home and was discharged from the service. He and his wife, Barbara, now deceased, moved to Peace River subdivision 28 years ago from Michigan. This story was first published in the Charlotte Sun newspaper, Port Charlotte, Fla. on Sunday, Dec. 2, 2007 and is republished with permission. Floyd V. Coffield, age 95, of Durand, Mich. passed away Sunday, May 31, 2015 at Maple Place of Grand Blanc, Mich. Funeral services will be 1:00 PM on Friday, June 5, 2015 at Watkins Brothers Funeral Homes in Durand. Burial will follow to Greenwood Cemetery in Vernon. Family will receive friends on Thursday from 2-4 and 6-8 PM and one hour prior to the service also at the funeral home. Floyd was born September 7, 1919 on the Coffield family homestead near Traverse City to James and Sarah Grace Coffield. The family moved to the Gaines area in 1922. 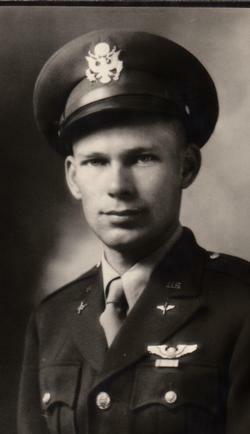 After graduating from Durand High School, Floyd joined the army where he became a B-24 pilot. He flew 51 missions over Europe in WWII and received the Distinguished Flying Cross for his service. He was discharged from the army in October 1945 as First Lieutenant. 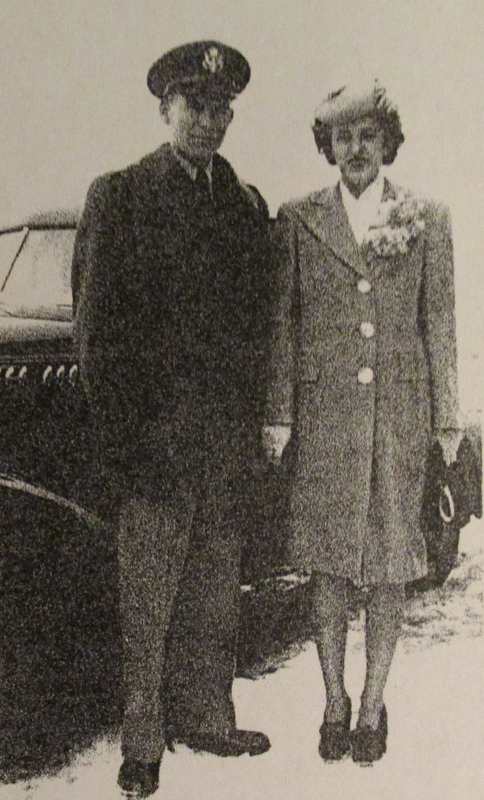 He married Barbara Pierce on February 5, 1945 and built a house in the Durand area. He operated Coffield Oil Company in Durand for 30 years. He served on the Gaines School Board, was active in the Masons, Eastern Stars and Job’s Daughters. He was a member of the Duffield Methodist Church and belonged to several veteran motor car clubs in Michigan and Florida. Floyd was survived by his children, Joanne (Ken) Parker, Tom (Pat) Coffield, Ted (Marian) Coffield, Dan (Katherine) Coffield and Doug (Vicki) Coffield; 18 grandchildren; 26 great grandchildren; his brother, Leo Coffield; sister-in-law, Izetta Coffield and many nieces and nephews. He was preceded in death by his wife Barbara and daughter Judy. Great story! Thanks for sharing this. It’s sad to know we lost another one of the greatest generation. Great story, my dad, clarence O’Brien, was with Floyd for all 51 missions. They were The Greatest Generation.I have more crew pictures. Don – if you have pictures, we would love to see them. This is Floyd’s grandson, Tim Parker (Joanne’s son). Floyd was my great uncle that I never met. Saddens me I did not. Yet I have great Respect and love for him. I wish i heard his stories in person and could see his medals. God speed uncle Floyd… Todd Martin.